Until the middle of the 16th century, Russian rulers had "knyaz" titles, which meant "duke" to foreigners. The first Tsar of Russia, equal in title to the kings of Western Europe, became Ivan IV The Terrible. Metropolitan bishop of Russia held a solemn ceremony of the wedding, presenting the young Ivan Vasilyevich with precious barmas regalia (round silk collar adorned with medallions), handing over the Holy Cross and putting the Monomakh's Cap on his head. The first Russian Tsar came to the throne on January 16, 1547. Since then, precious attributes of power have accompanied Russian autocrats up until the very end of the monarchy system in 1917. 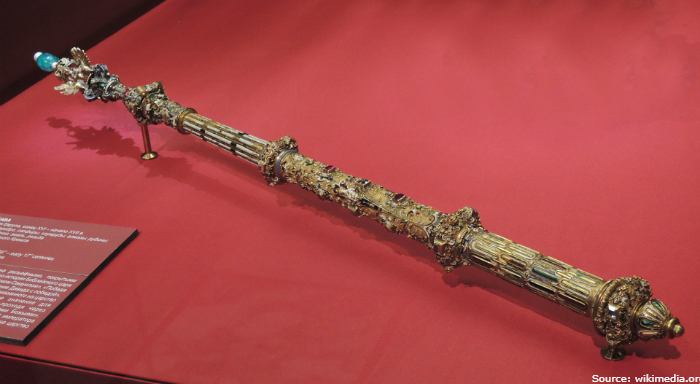 In the photo: The sceptre of Tsar Mikhail Fyodorovich, the oldest surviving Tsar's royal staff. The staff, or "sceptre" in Greek is an ancient attribute of the rulers. A long rod of wood or bone, trimmed in gold, went from the Pharaohs of Ancient Egypt to the Roman emperors. In the Middle Ages, the royal symbol got smaller in length (half the normal size) and increased in its value. 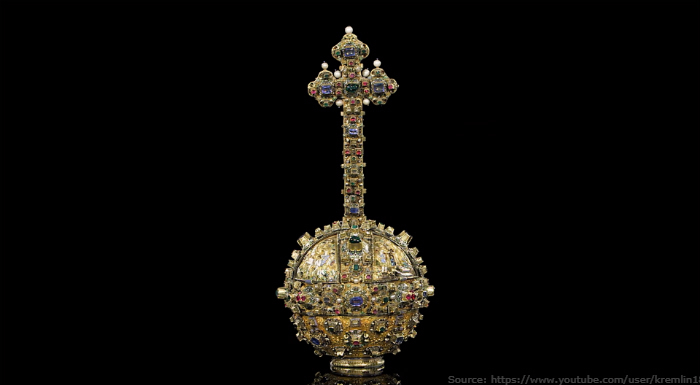 Since then, sceptres of European rulers were made of gold, decorated with precious stones and pearls. The Russian Tsar Fyodor Ivanovich, son of Ivan the Terrible, received his first precious sceptre during the coronation ceremony in 1584. Since then, the sceptre has become the main symbol of Russian statehood. The golden staff in the hands of the monarch symbolizes a good pastor who cares for his congregation. The royal attribute is made of gold, adorned with three eagles and a small crown with an emerald, decorated with 20 diamonds and other precious stones. Precious gold sceptres of Russian autocrats are exhibited in the Kremlin's museums. In the photo: The orb of Tsar Mikhail Fyodorovich. The second most important royal regalia is the orb, or "the golden apple." Presumably, a massive golden ball with 200 precious stones has been made by Western European masters. 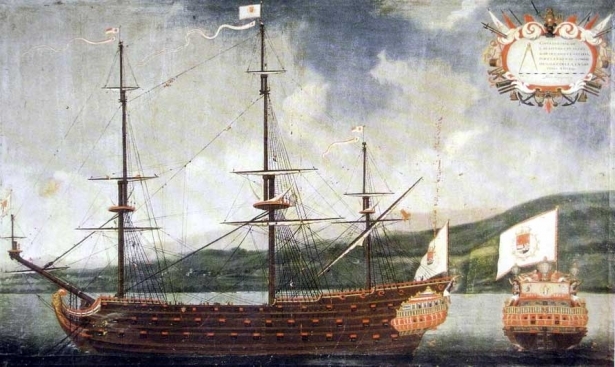 "Apple" is adorned with a golden cross, which serves as a symbol of the supremacy of the Christian king in the state. Enamels on the exterior of the ball that depict scenes from the Old Testament are of particular significance to art historians. Along with the sceptre and the Monomakh’s Capt, the "royal apple" was part of the "Royal Attire", the main ceremonial dress of Russian Tsars in the 17th century. The first Russian orb is demonstrated in the Kremlin’s Armoury Chamber in Moscow. 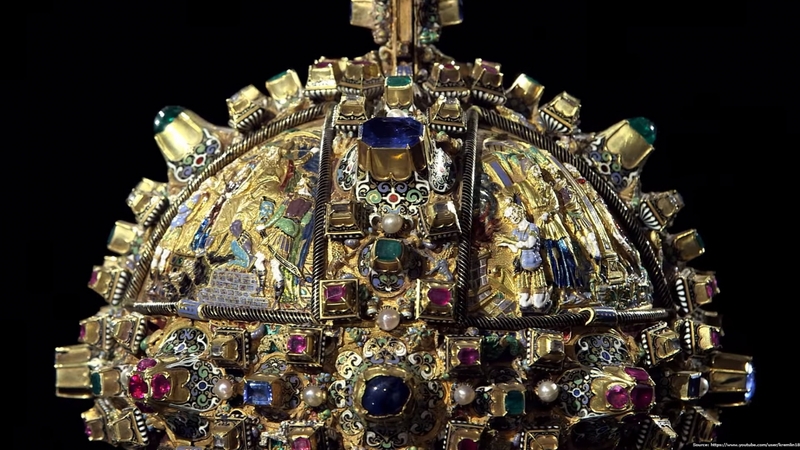 In the photo: An ancient Russian crown, the origin of which is still a mystery. 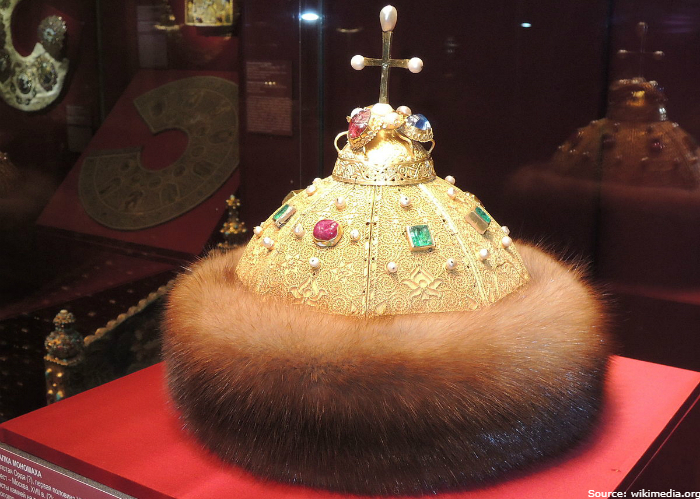 The symbol of the Russian Tsar’s power, the Monomakh’s Cap, dates back to the 14th century. The royal attribute is made of gold, trimmed with sable fur, decorated with 32 pearls and 11 precious stones. The Monomakh's Cap weighs 993 grams, the height of the headdress is 25 centimeters. Historians mention three possible versions of the royal crown’s place of origin: Byzantium, Mongolia and Moscow. The experts who analyzed the cap’s material adhere to the Moscow version. It is believed that the famous attribute was made in the 14th century from the golden helmets of the Russian knyazes of the 13th century. All Russian Tsars, starting from the 16th to 17th centuries, were crowned with The Monomakh’s Cap. Peter I, nicknamed the Great, became the last king who was crowned with an ancient symbol of power. Peter introduced the crown, which replaced the cap and was worn by the first Russian Empress Catherine the Great. The golden cap is stored in the Kremlin’s Armoury Chamber along with other royal headdresses. In the photo: the golden throne of Tsar Mikhail Fyodorovich, the 16th century. 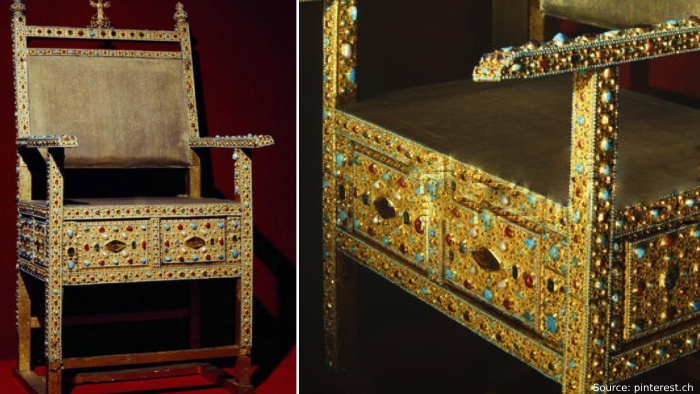 The wooden framework of the throne is covered with gold plates, on which 1964 precious stones are placed: rubies, tourmaline, sapphires and pearls. Persian Shah Tahmasp I gave the first Russian Tsar Ivan the Terrible a golden throne adorned with 3000 precious stones; a chronicle of that time testifies. The Tsar accepted the gift with delight — the sight of such wealth, beauty and skilful work impressed him. Tsar Mikhail Fyodorovich first sat on the golden throne at the coronation ceremony in the early 17th century. Russian Tsars, during the next hundred years, took the golden throne with them for visiting ceremonies and the throne gradually lost its look. At the end of the 17th century, the "royal seat" was restored and placed in a vault. Now it is exhibited in the Moscow’s Kremlin Armoury Chamber. In the photo: Barmas of Tsar Aleksey Mikhailovich. 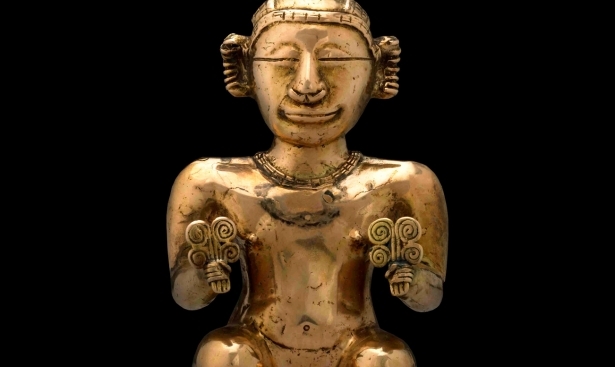 Barmas represent a jewelry in the form of a gold necklace with round pendants or a collar adorned with gold, precious stones and an enamel with religious themes. The golden armor, worn by Russian knyazes, was first mentioned in chronicles in 1216. The phrase "sacred barmas" appears in the Russian chronicle of the 14th century. Since the 15th century, these precious jewels have become a permanent attribute of the coronation of Russian Tsars. 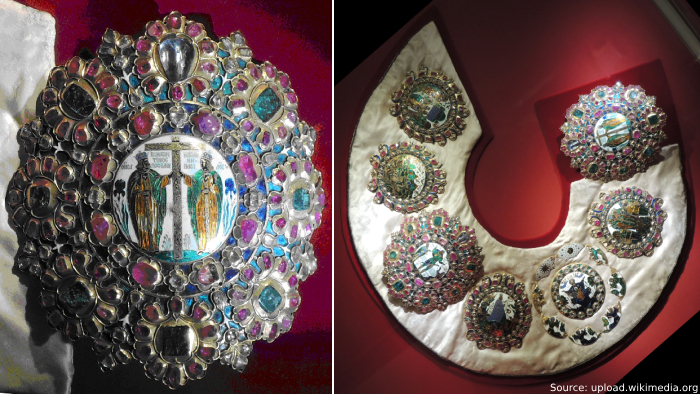 The barmas worn by Tsar Aleksey at the coronation, nicknamed Serenissima, consist of seven large medallions fastened on a satin collar. The medallions are made of gold, large enamel miniatures with evangelical themes framed by an openwork gold frame are in the center. 248 diamonds and 500 other precious stones adorn the royal armor. In the photo: 12th century barmas found in the excavations of ancient Ryazan. 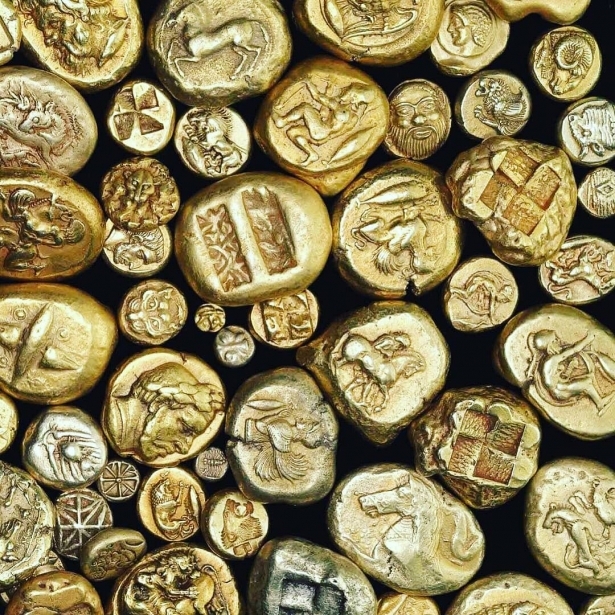 The oldest golden barmas that have survived to this day are found in the excavations in Ryazan. 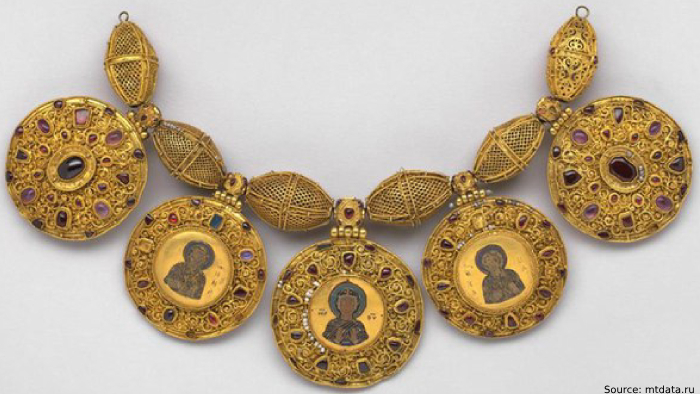 The 12th century necklace impresses with the fineness of the jewelry work and the beauty of the enamel. The royal regalia most likely belonged to the Knyaz of Ryazan. Batu Khan burned Ryazan in the 13th century and barmas disappeared, but 600 years later they were found by archaeologists and returned to the treasury. Royal barmas are on display in the Kremlin’s Armoury Chamber. Golden symbols of power emphasized the greatness and well-being of the Russian state, guarded by the Kremlin’s treasury and were used for special occasions.